How Would Physicians Choose to Replace the ACA? How Will the U.S. Health Act Repeal Affect Unemployment? House Passes AHCA – Will it Pass the Senate? 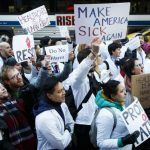 The American Health Care Act – Why the Rush? High-Risk Pools for Preexisting Conditions – How Quick We Forget!